alaTest has collected and analyzed 40 reviews of Sony Handycam DCR SR50E. The average rating for this product is 3.9/5, compared to an average rating of 4.1/5 for other Camcorders for all reviews. Reviewers really like the zoom and image quality. The size and portability also get good comments. Opinions are divided on the battery. Some have doubts about the price. We analyzed user and expert ratings, product age and more factors. 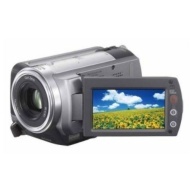 Compared to other Camcorders the Sony Handycam DCR SR50E is awarded an overall alaScore™ of 75/100 = Good quality. Easy to use, reasonably quick startup, widescreen, fast PC transfer. Typical Sony quality, video clarity and colours first class, very easy to operate. Spare Sony battery expensive, cheaper non Sony brands alternatives available.